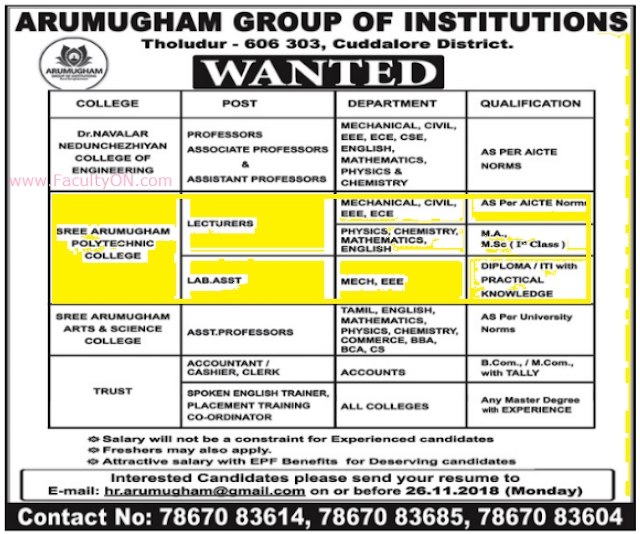 Sree Arumugham Polytechnic College, Cuddalore has advertised in the DINAMALAR newspaper for the recruitment of Lecturers / Lab Assistants jobs vacancies. Interested and eligible job aspirants are requested to apply on or before 26th November 2018. Check out further more details below. About College: Sree Arumugham Polytechnic College was founded by philanthropic and charitable Arumuga Mudhaliar Sornam Educational Trust,Tittagudi in the academic year 2009. The main objective of the Trust is to promote higher education among the rural people of the country.